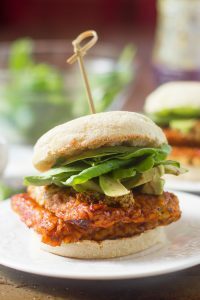 These tempeh breakfast sandwiches are made with pan-fried tempeh in a savory sauce, stuffed in an English muffin and piled with avocado and baby spinach. Whisk the soy sauce, maple syrup, vinegar, garlic, paprika and pepper together in a small bowl. Slice the tempeh in half, thickness-wise, so you end up with two thin slabs. Slice each of your slabs in half or thirds, so you end up with 4-6 slabs total. Coat a large skillet with olive oil and place it over medium-high heat. Add the tempeh slabs in an even layer and cook until they're browned on the bottoms, about 3 minutes. Pour soy sauce mixture over tempeh and cook another minute or so, until the sauce dries up and forms a thick coating on the tempeh. Flip tempeh slabs and cook about 3 more minutes, until browned on opposite sides and most of the liquid has cooked off. Slather the English muffins with ketchup, Dijon and any other dressings you like. Stuff the muffins with tempeh slabs, topped with avocado slices and baby spinach. Check the ingredients on your English muffins before buying them, as not all brands are vegan. Trader Joe's British Muffins are vegan.